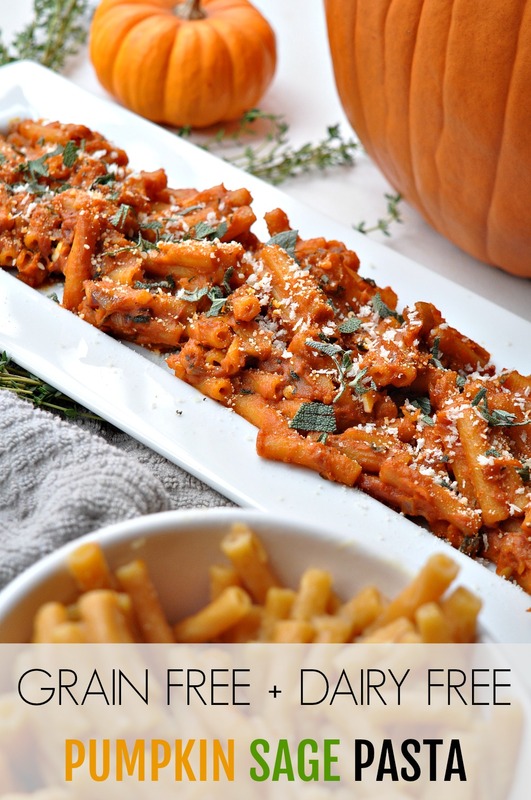 Combining two cold fighting herbs, sage and thyme, to create this dairy free pumpkin sauce pasta. 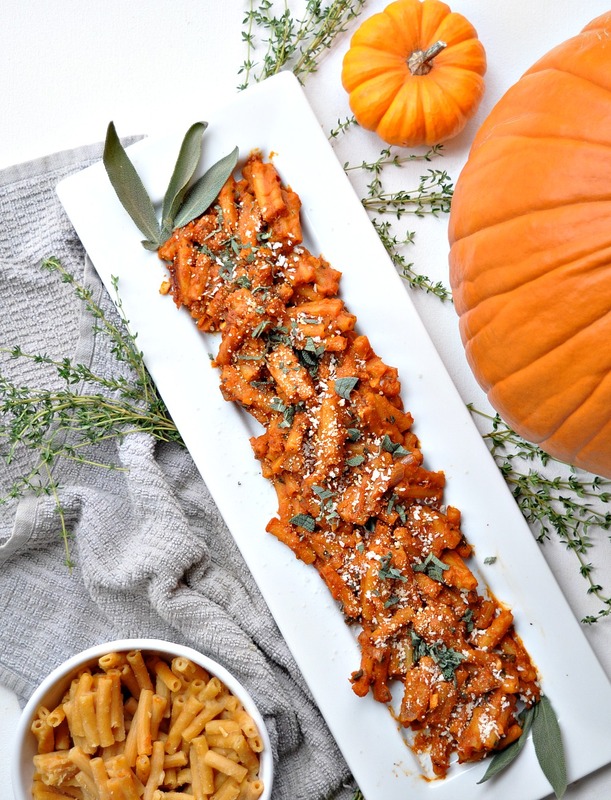 This recipe is gluten free, grain free, and vegan! Sage and thyme are two herbs that I’m going to be incorporating into so many recipes and natural wellness remedies this winter! Why? Because they both have many wonderful properties that fight off infection and germies that lead to the cold and flu. I’ll discuss in detail in my ingredient nutrition breakdown below! 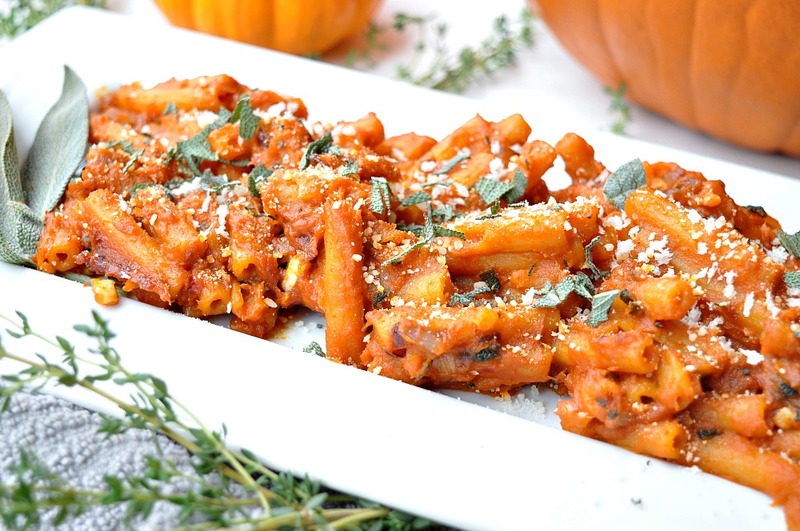 This sage pumpkin pasta is yet another easy weeknight meal to whip up with minimal effort. All you need to do is stock up on the right ingredients and you can make it in 30 minutes flat! 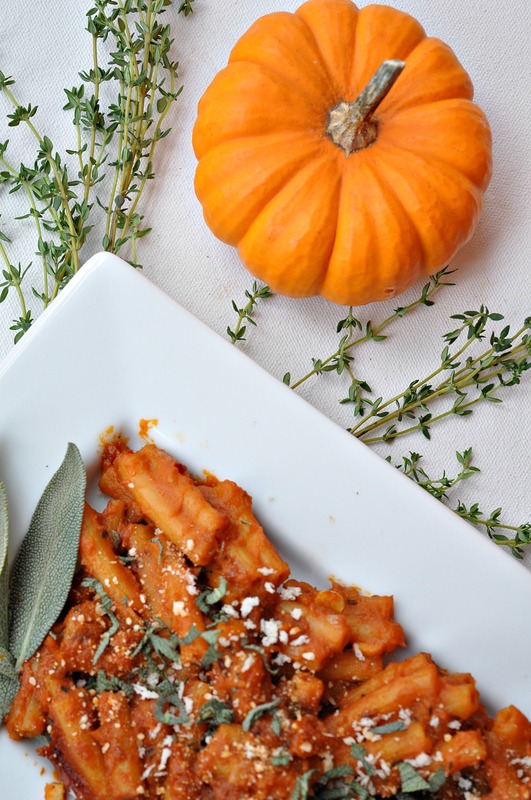 If you are still on a pumpkin kick like I am, you will definitely satisfy your winter squash cravings. Another little trick I use to make this grain free is by using lentil noodles instead of wheat noodles. This way you are still consuming what your mind thinks is traditional “pasta” but it is actually grain and gluten-free! Yippie skippie. Protein from the red lentil noodles. 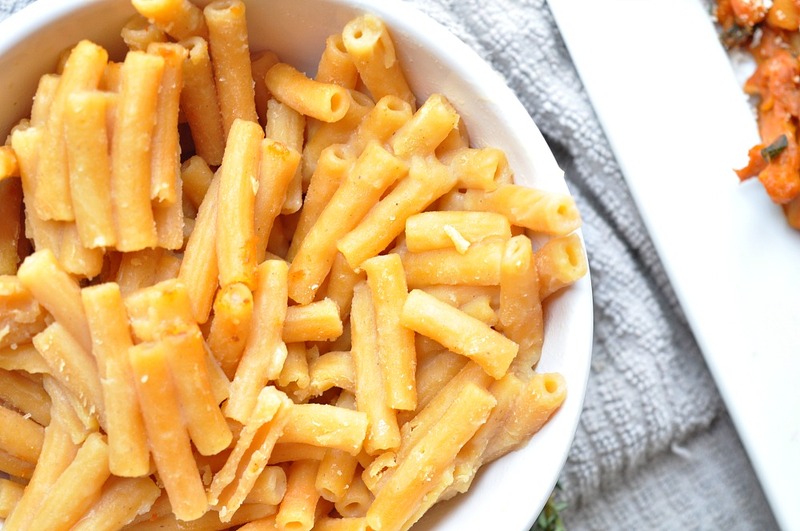 You can browse online to shop around for a red lentil pasta that piques your interest most. I usually find my red lentil pasta from, you guessed it, Whole Foods or Trader Joe’s – my two go-to places to shop. It probably helps that I live less than two blocks away from each grocery store. Beta carotene from the pumpkin puree – a wonderful plant pigment antioxidant that protects you from free radicals. The more antioxidants in your daily diet, the better! Sage can help with digestive issues like bloating and gas, it may treat inflammation, it is also packed with antioxidants, and it has antimicrobial properties that help boost our immune system. I also use dried sage as an incense to clear out the energy in my home when I move furniture around or after a situation in my life that drains me of my energy. There are so many different uses for sage – I’ll have to create an article on just that. Thyme is another herb that has antimicrobial and antiviral properties thus making it a fab herb to fight off germs and colds. The almond milk also provides vitamin E that acts as a healthy fat – let’s not forget that we always need healthy fats in our diet! 3/4 cup butternut squash soup – I use mine from Trader Joes or you can buy regular butternut squash soup from Jewel or Whole Foods. Make the red lentil pasta according to package directions. Drain in a colander and set it aside in the sink. In the same pot that you made the pasta, heat up 1 tbsp olive oil and add the diced shallot and garlic. Cook for 3-4 minutes until both ingredients are semi see through. Add the sage and thyme to the pot and cook for another 1-2 minutes. Add the tomato paste, almond milk, nutritional yeast, and butternut squash soup to the pot and cook for 5-6 minutes until it forms a creamy sauce texture. Once the sauce is complete, add the pasta to the pot – toss the pasta around the sauce, then serve and enjoy! A few notes: If you don’t want your pasta to have a slight spicy kick to it, you do not need to use the paprika, chili flakes and cayenne pepper. You can also leave out the butternut squash soup, but I like adding it for extra flavor and a richer, thicker sauce base. If you make this recipe, please share with us on twitter or Instagram using the hashtag #balancedbabe – we would love to see and share your creation with the community!